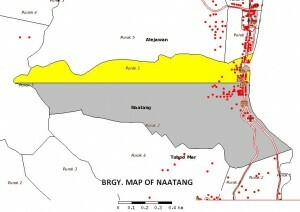 Naatang is a barangay located on the eastern coast of the Municipality of Jagna, Bohol. It is exactly 5 kilometers from the town proper, it lies almost halfway between the towns of Jagna and Duero, Bohol. It got its name from the word “ATANG” meaning an ambush that happened during the Spanish time. Rampant maltreatment, slavery and torture of the inhabitants by the rulers were visible during this era. Because of its proximity to the hinterland, it was made a place of refuge by the “insurrectos” (insurgents) due to lush vegetation and forest cover, which was suited for camouflage. It is said that the Filipino soldiers known asinsurrectos had no match to fight against the powerful Spaniards. Irked by the treatment accorded by the Spaniards, the insurrectos gathered and planned an ambush to the Spanish soldiers. One night, when the Spaniards roamed and patrolled from Mambool, Duero to the highway proceeding to the town of Jagna, the insurrectos in the nearby barangay of Alejawan made an “ali” meaning blockade to the Spanish soldiers. A fierce and bloody encounter occurred between the two groups. 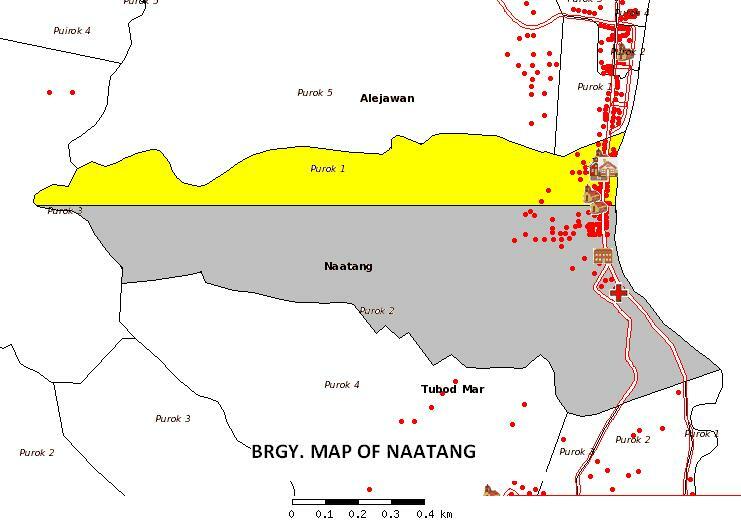 Sensing a strong force of bolos and spears of the insurgents, the Spaniards fled and escaped towards Naatang. But when they reached the place, a surprise attack ensued. The natives of the place made an “atang” and the courage and strength of the insurrectos were tested. The air was filled with black smoke, blood and lifeless bodies scattered around the place. Many men had been killed and many others wounded. During the Spanish occupation, a small school building was created. Spanish was taught to the children. One of the teachers was Santiago Acedo. They used banana leaves for paper and coconut midribs for pencil to learn writing in school. Sometimes charcoals were used to write on the pieces of boards. After the World War 2, when classes were reorganized, a Parent-Teacher Association was formed in Naatang Elementary School. This organization repaired the school and constructed temporary home economics building, out of light materials such as bamboos, nipas, etc. People empowerment and unity of Barangay Naatang and to achieve progress and total development, clean, peaceful and beautiful to place to live in. To unite, believe in our strength and capacity. To achieve good governance, instill in us the importance of ecological balance and adapt new technologies for economic progress.